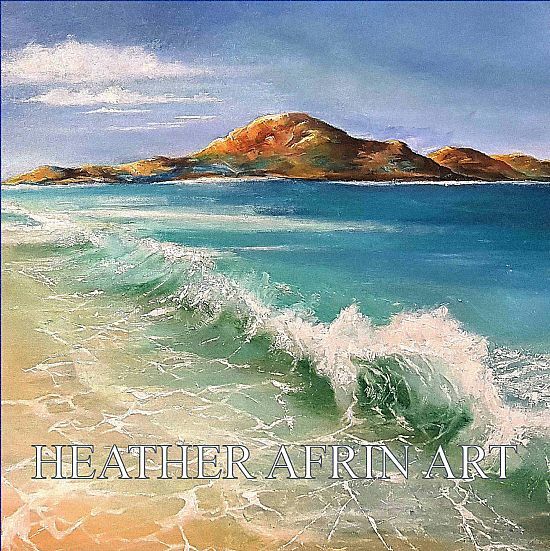 Heather Afrin is a contemporary Scottish artist creating atmospheric and colourful watercolour and oil paintings / illustrations of the Highlands and Islands of Scotland – including seascapes, townscapes, illustrations of local mountain bothies or some of the wonderful whimsical Scottish creatures living around us, and a few flowers thrown in for good measure. Heather grew up on the Isle of Lewis and now lives with her family in Inverness – the capital of the Highlands of Scotland. Both these areas feature extensively in her work, with the sea and village architecture being a main focus. Heathers work can be purchased as originals – if available, framed prints and mounted prints in a variety of sizes (if your required size is not listed – get in touch) as well as mugs, coasters, notepads, pocket mirrors etc. Many thanks for popping by for a look and I hope you find something you like.